FAIRFAX, Va. – Sheet metal industry professionals from across the country gathered in Las Vegas April 25-29 to continue their educations by attending classes, testing for certifications, and networking with industry leaders during the 15th annual ICB Conference. Approximately 127 working professionals attended the joint labor and management event and participated in 15 classes and seven certifications. Overall, 84 attendees passed certification exams such as National Air Filtration Association (NAFA), EPA 608, Fire Life Safety Level I and II Supervisor, TABB Supervisor, Sound and Vibration Supervisor, and Mechanical Acceptance Test Technician. New courses this year include Blue Beam software; coalescing air and dirt separators; HVAC Fire Life Safety legislation; marketing HVAC Fire Life Safety; hospital work and TAB; and infectious control risk assessment (ICRA), which was presented as a pilot program and exam. Of the new courses, the ICRA program, which completed its third pilot run at the conference, created the most excitement, as professionals across the country are revving up for work created by “one of the hottest emerging markets right now,” Casey said. Led by Don Steltz, executive administrator for Local No. 66’s Western Washington Sheet Metal JATC in Seattle, and assisted by Darrell Garrison, TAB/service specialist and field representative for the International Training Institute (ITI), the class welcomed Richard Helfrich, certified health care facilities manager for Thedacare Regional Medical Center in Appleton, Wisconsin, who provided professional expertise during the two-day course. During the class, and the exam that followed, instructors and ICB staff sought input and feedback from participants to improve the course and the test questions. In conjunction with the Sheet Metal Occupational Health Institute Trust (SMOHIT), the class covered best ICRA practices for sheet metal workers. The Centers for Disease Control and Prevention estimates 99,000 people die annually from hospital-acquired infections, including Legionnaires’ disease, MRSA, pneumonia, tuberculosis and others that are becoming antibiotic-resistant. From a professional health care facility manager’s perspective, the presentation and test are beneficial to all involved, Helfrich added. 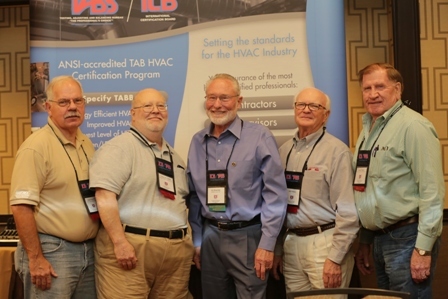 ICB/TABB is the first program to gain ANSI accreditation under ISO 17024 for certification in the HVAC testing, adjusting and balancing and Fire Life Safety industry. ICB/TABB certification is a statement that the technician, supervisor and contractor demonstrate the highest level of professional expertise. ICB/TABB is a function of the National Energy Management Institute Committee (NEMIC), a not-for-profit organization jointly funded by the Sheet Metal and Air Conditioning Contractors’ National Association (SMACNA) and SMART, the International Association of Sheet Metal Air, Rail and Transportation Workers (formerly the Sheet Metal Workers’ International Association). NEMIC identifies opportunities, seeking to create or expand employment for SMART members and programs that assist SMACNA contractors. For more information on emerging market opportunities in the sheet metal and air conditioning industry, contact the National Energy Management Institute Committee (NEMIC) at www.TABBCertified.org call 800-458-6525. Originally posted on Eye on Sheet Metal.